The first Tender Loving Care (TLC) updates for the million-selling dinosaur survival game, ARK: Survival Evolved. Feel the Valentine’s Day love from the Studio Wildcard team! In ARK Update v278, currently available on PC with an upcoming console release, five creatures (The Procoptodon, The Gigantopithecus, The Direbear, The Direwolf, and The Rex) received visual model redesigns, animation changes, and new special abilities! This update also provided a huge swath of quality-of-life improvements and enhancements in response to community feedback. Tames have a 5% chance to drop a Chocolate Cake when they mate. A Chocolate Cake can be used for a Full Heal or to advance 50% of a creature’s taming affinity bar. Specially-colored Red, Pink, and White wild creatures can be found wandering the ARK searching for true love’s kiss. All servers using the following command line parameter: -vday can get some extra mate-boosted bonuses. Survivors also have the opportunity to send out their own customs Valentine’s Day card to their loved ones! Head over to http://playark.com/valentines/ to create a custom ARK dino card! The Procoptodon: This prehistoric pouch wearer is getting a model and animation update, along with a sound pass and some new abilities. The Procoptodon will take reduced fall damage, along with a noticeable increase in its carry weight. And speaking of carrying, it can now carry small creatures and baby dinos in its pouch! Carried characters in pouch have reduced food consumption rate when carried by Mate-Boosted Female Procoptodons, and babies imprinted while in a carried Procoptodon pouch will receive more affinity. Additionally, the Procoptodon now has a knockback kick which can affect significantly larger dinos, along with an aimed jump which can be used by holding down the Jump key. The Gigantopithecus A.K.A. 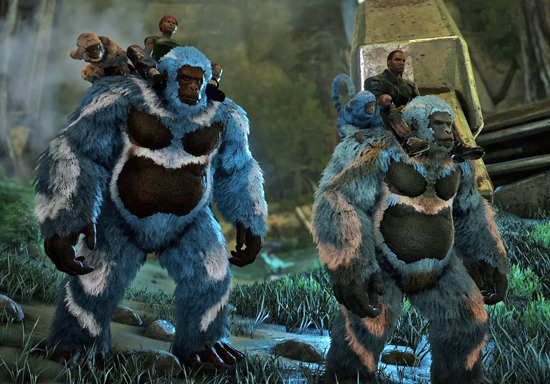 Bigfoot: The Bigfoot has received a model and animation update, new fur, a sound pass, and some new abilities. It now has an armor-degrading attack which will do more damage to survivor’s armor durability in a fight. However, this attack will not affect the Yeti creatures found in the game. The Bigfoot can now jump, has the ability to climb ziplines (but not jump between them) and can now carry and throw small creatures. Throwing has also been made more accurate, similar to crabs with the targeting cursor. The Direbear: The Direbear is receiving a model and animation update, gorgeous new fur, and some new abilities. Players are now immune to bees when riding a Direbear as the bees will focus on the bear instead, making you unable to be knocked down by them. The Direbear is now also able to harvest honey from wild beehives without attracting bees or hurting the hive with its alternative attack. Plus, the amount of honey the Direbear receives is now three times the normal amount, pretty sweet indeed! The Direwolf: The Direwolf has received a model and animation update, along with new fur and abilities. Now, a Howl activates a pack buff for five minutes, with a one-minute cooldown. When the Alpha howls, the pack will also howl. The pack buff strengthens the Alpha, as well as the pack who receive a reduced amount compared to the Alpha. The Hunter’s Instinct passive buff will allow it to sniff out people and creatures with less than 50% health. And the Sniff tertiary ability can indicate nearby explorer notes, or detect buried or stealth creatures. The Rex: The Rex receives a model and animation update, and some new abilities. Its roar should receive a CD and make non-allies (under a certain dragweight) poop to act as a small stun or interrupt. Talk about scaring the poop out of someone! However, there will be a cooldown on victims, so that they cannot be thrown into a perpetual state of poop-frozen terror. Also, the roar won’t be able to scare anything above the Rex’s level. Roar will cause players to poop, but will not stun them. But the new changes aren’t all about poop, as the Rex’s ability to climb over small rocks and steeper slopes has also been improved.